I recently heard a father speak about his daughter’s upcoming wedding. He said: “I’ll be glad when it is over.” He was excited for his daughter and son-in-law-to-be, but was also frustrated with how the Sacrament of Holy Matrimony was getting lost in all the other details of planning for the day. That seems to be a good analogy for young parents today who have many other challenging, but less important matters to contend with in fulfilling their greatest responsibility of raising their children in the faith. It can be difficult to keep this priority front and center in the formation of their children. Our Archdiocesan Catholic Schools are a great treasure! Historically in this country, they are like the hidden treasure which is discovered, and once discovered, that person sells everything else to possess that one precious pearl. (see Matthew 13:44-45) One of the primary reasons our Catholic Schools exist is to help our children (and their parents) arrive at their ultimate life goal, the Kingdom of Heaven. Catholic Education has always come at a cost; to the founders, the parishes, and the families. Today is no different. But why have so many made such sacrifices for so long to provide their children a Catholic Education? Simple: For the love of God. I think of the Indiana Saint, Mother Theodore Guerin, (1798-1856) the foundress of the Sisters of Providence in Indiana. She entered the convent in France, then at the invitation of the first Bishop of Vincennes, Bishop Simon Brute, came to the United States in 1840 to establish not just a community of women religious, but a system of Catholic Schools in Indiana. Mother Theodore and the five sisters who came with her faced tremendous hardships, from the months’ long crossing of the stormy Atlantic, to treacherous cross country travel from the East Coast to the remote forest of Indiana. They lived with a bare minimum of essentials, but the one thing they required was a small cabin to serve as a chapel where the Blessed Sacrament was reserved. They needed the companionship and presence of Our Lord. The presence of the Lord and their love for Jesus is essentially what motivated these sisters to begin a Catholic School system to provide a solid education for children, most of whom were poor. Thus, more than once, Mother Theodore made the long and treacherous journey back to Europe to raise the necessary funds to establish and expand the growing need for Catholic Schools. Such was Mother’s love for God, and love for His people. This is the love which is still at the heart and sacrifice of Catholic Schools today. Priests, parish leaders, parishes, benefactors, parents and families all come together out of a love for our Catholic Faith to keep our Catholic schools thriving – still providing the basics of solid academics, formation in the faith, and forming young men and women into the fullness of who God created them to be. Studies show that the single greatest reason that young adults stay involved in the Church is the influence of their parents—from regularly talking about the faith at home, to living that faith openly through outreach to the marginalized, to enrolling their children in Catholic schools. The data speaks clearly: attending Catholic school dramatically increases the likelihood that children will remain active in the Church upon reaching adulthood. Parents, we know you have many challenges today when it comes to raising your children in the faith. Our Catholic Schools are here to serve you and your children. We have room in our schools for your children, and our Catholic Schools surround your children throughout the day and the academic year with the values and virtues that help you in your responsibility to raise them in the faith. Have you thought about Catholic education for your children? 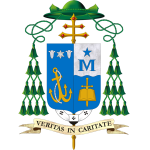 The Archdiocese of Anchorage is proud of our four Catholic Schools. 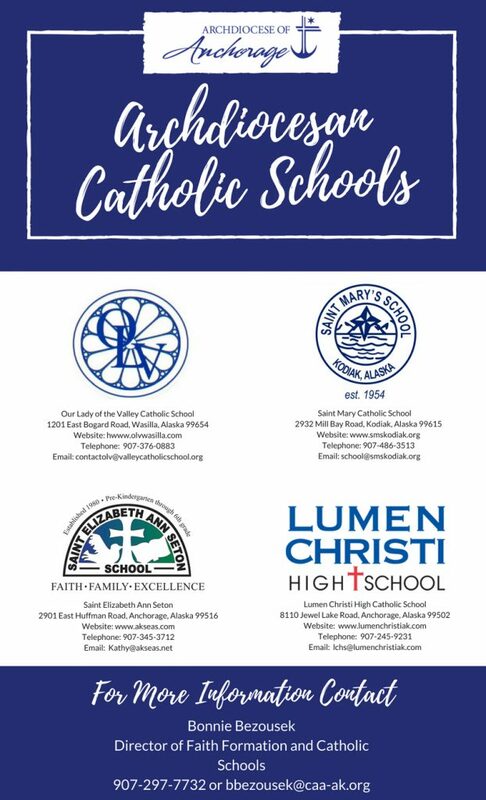 This is a great time to call one of these schools and schedule a visit to see and hear about the great educational opportunities we offer in the Catholic tradition. Parents, be clear and decisive about your responsibility to raise your children in the Catholic Faith. Enroll your child in a Catholic School of the Archdiocese of Anchorage today!